Icy Tower Game is a fun and short, yet addictive game where your only goal is to gain as much score as possible. Harold the Homeboy and his friends have decided to climb a huge tower they found the other day. 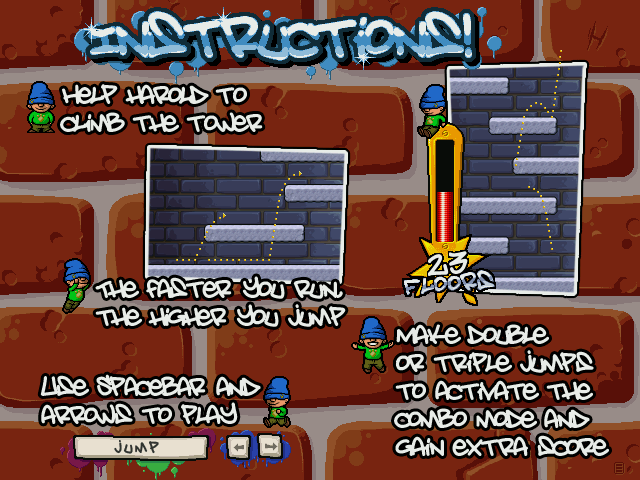 Icy Tower Game is up to you to help them get as high as possible without falling down, and collect extra points by doing cool moves on the way. Icy Tower's addictive gameplay - you'll come back for more! Icy Tower - fun, short, yet addictive game to get as much score as possible. Qweas is providing links to Icy Tower 1.5 as a courtesy, and makes no representations regarding Icy Tower or any other applications or any information related thereto. Any questions, complaints or claims regarding this application Icy Tower 1.5 must be directed to the appropriate software vendor. You may click the publisher link of Icy Tower on the top of this page to get more details about the vendor.